NCR has advertised a job notification for the Trade Apprentices Recruitment with the title of NCR Jhansi Trade Apprentice Recruitment 2018. It is available in ncr.indianrailways.gov.in recruitment page. NCR Jhansi is the junction where the NCR Jhansi Apprentice Recruitment is going on from 24th Nov 2018 to 31st Dec 2018. take the given notification and scrutinize in the complete and download the NCR Jhansi Apprentice Application form to send it before 17 Dec 2018. Latest Update(10th Dec 2018): In the NCR zone for UP state along with the 441 Apprentice Vacancy notification, a new notification with 205 Apprentice Posts is released. Apply before 31st Dec 2018. Latest NCR Jhansi Apprentice Recruitment for 650 posts which has been notified to all the railway job aspiring candidates. This is a good chance of employment to begin their career in the Railway zone of the North Central railways for the office of Jhansi. Yes, the qualified candidates in the NCR Jhansi Trade Apprentice recruitment process will get the posting in Jhansi only. Jhansi is the city in Uttar Pradesh State. The complete set of vacancies is 446 vacancies + 205 Vacancy. The advertisement of this NCR Jhansi Apprentice posts is delivered into the public on 24th Nov 2018, that day is also the opening date of the application form. The complete qualifications for NCR Trade Apprentice Recruitment 2018 notification as per the job wise. The candidates who want to apply for these vacancies should have passed a 10th class examination or its equivalent (under 10+2 system) with minimum 50% marks and possess essential ITI passed certificate in related trade from a recognized Industrial Training Institute affiliated to NCVT. Certificate issued by the principal is not accepted. that is maximum age is 24 years. All applicants have to pay Rs.100/- in the name of the application fees. Selected candidates will get the pay scale as per the norms of the NCR Jhansi Trade Apprentice Recruitment 2018 is as per extant rules & directives issued by Railway Board from time to time. Office of the Divisional Railway ManagerPersonnel Dept. (R&D Section)North Central Railway, Jhansi U.P. 284003. The recruitment has clearly explained the details about this NCR Jhansi Apprentice recruitment, in case if they need more they have found during the process of filling the application form for this NCR Jhansi Trade Vacancies that doubts can be sorted if you comment that doubt at the below of the post. 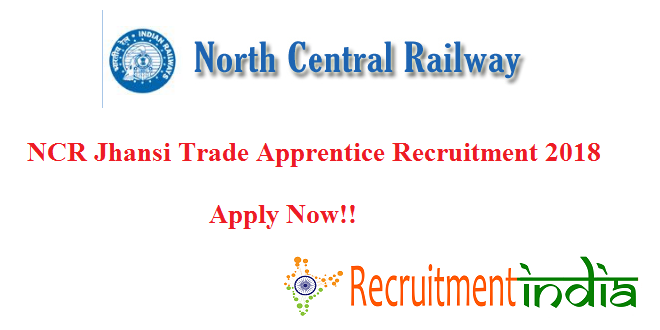 The railway job seekers never miss out this opportunity and definitely will apply for these North Central Railway Jhansi Apprentice vacancies. If you have the practice papers then currently here are available for the seekers. Must hold at present and start now the exam preparation section. As this is a railway job, you can estimate the competition present in these type of North Central Railway Jhansi Apprentice vacancy 2018 up to 650 posts are available to this Notification. So think about it. Start your preparation now itself that is from the beginning date of application of NCR Jhansi Apprentice 2018 notification. The pattern of syllabus of this Trade Apprentice exam can be taken from our site. Really railway job interested candidates would definitely need this NCR Jhansi recruitment to start a career in the railway sector.